Sleep apnea is a potentially serious sleep disorder that causes breathing to repeatedly stop and start during sleep and may result in insufficient oxygen to the brain and the rest of the body. In obstructive sleep apnea (OSA), the most common type of apnea, the soft tissue in the back of the throat collapses when you fall asleep, which blocks the airway. If these measures don’t improve sleep or if apnea is moderate to severe, then a doctor may recommend other treatments. Continuous Positive Airway Pressure (CPAP) therapy is the most prescribed method by doctors to treat OSA. A description of the equipment, how it functions and features to consider when selecting a CPAP machine to follow. Before purchasing or renting any CPAP therapy equipment consult a doctor for a diagnosis and therapy recommendation. A machine that pressurizes ambient air for specific pressure needs. A flexible tube to deliver the pressurized air. A mask or nasal prongs through which air gently blows directly into the patient’s airways. The basic CPAP machine is often referred to as a “fan in a box.” Without any special features, it simply allows patients to get a good night’s sleep by providing continuous pressurized air to the throat airway. Doctors may recommend an Auto CPAP machine for a patient who requires fluctuating air pressure during sleep. While the basic CPAP machine provides only one pressure, the Auto CPAP machine has the ability to measure the pressure continuously and adjust so the correct amount of pressure to keep the airways open. The bi-level positive airway pressure (BiPAP) machine offers sleep apnea sufferers two levels of air pressure. While the Basic and Auto CPAP machines continuously apply the same pressure whenever you inhale or exhale, the BiPAP machines find the optimal air pressure and flow based on a patient’s breathing. A high-pressure air flow is applied from the machine when the patient inhales and a lower pressure when exhaling. Mask selection: finding the right mask, one that is comfortable and functions correctly is essential to a successful sleep therapy. Noise: while almost all CPAP machines available on the market today are whisper quiet (below 30 db. ), some are quieter than others. Humidifier: the continuous blowing of air from a mask can cause a dry and irritated throat. A humidifier will resolve most dry-throat conditions. Portability: for travel, a small, lightweight, compact machine may be the best option. 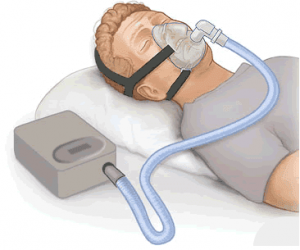 Ramping: for the patient with moderate to severe sleep apnea requiring high-pressure air flow, ramping permits a gradual build-up to the prescribed pressure after the mask is first placed on the face. Exhalation pressure relief: makes it easier to exhale against the incoming pressurized air. For inhalation, the machine maintains the preset air pressure settings but scales them back during exhalation. Heated tubing: a small heating coil placed in the mask tubing that maintains the air at a constant temperature and therefore reduces condensation build-up. Mask On/Off Alert: beeps to wake the sleeper if the mask comes off or loses its seal during sleep. Leak Compensation: if the mask leaks air for any reason, the machine can compensate by increasing the airflow to ensure the prescribed pressure is maintained. Data Recording: Many machines come with data recording capabilities. Some only record basic information like time of operation, while others provide detailed information on what happens while you are asleep such as duration of your snoring, the number of decibels, leak rates, pressure changes, the number of sleep apnea events, and more. The selection of a CPAP mask may be the most important factor in determining the success of a sleep apnea therapy. It is worn at night over the nose only or both the nose and mouth. Several style options are available, providing the patient with the opportunity to find a model that is comfortable and functions correctly. To select the appropriate mask, the patient should seek the advice of a sleep therapy doctor. Once selected, a trial period is recommended to assure proper function. 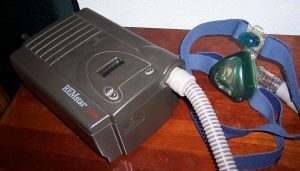 CPAP machines may be rented, or purchased on a trial basis with an option to change equipment until the right one is found. Here are the most common mask types and their characteristics. The Nasal CPAP mask has a triangular shape that covers the nose only and is held in place by a four-point headgear. Made of silicone, gel, or cloth, it is available in a wide variety of sizes and shapes. Works well for patients who mostly breathe through their nose. Nasal cushions create a good seal around the nose, in a small profile mask. Provides more natural airflow than nasal pillows, because the airflow isn’t delivered directly. Superior to nasal pillows for higher-pressure settings. Offers a flexible fit with many different styles that cater to a wide range of facial structures and features. May cause discomfort if worn by those who have sinus issues that are allergy or cold-related. The Full-Face CPAP mask has a triangular shape that seals around the nose and mouth and is held in place by a four-point headgear. 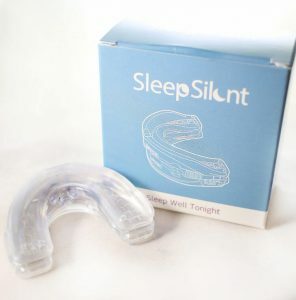 Works well for patients who breathe through their mouths while sleeping. Also works well if CPAP uses causes frequent dry mouth. Has a tight seal that works even for patients that sleep on their back. The larger surface area makes the mask comfortable for patients who require higher CPAP pressure levels. More comfortable for patients who feel claustrophobic when using regular CPAP masks as the full-face mask only touches the outside of the face. The larger surface area creates a higher risk of air leakage. May cause dry, irritated eyes. Watching TV, reading or wearing glasses can be difficult with the mask. The bulk of the mask makes it difficult to sleep on the stomach. Works well for patients with chronic sinus issues or congestion due to seasonal allergies or a cold. Nasal Pillow CPAP masks do not cover the mouth and use a soft pillow to seal around the base of the nostrils. They are a favorite among sleep apnea patients who want an interface that is smaller in design and results in less facial interference. Provides a feeling of openness and freedom. Keeps the field of vision clear so anyone with glasses or who enjoys reading or watching TV before bedtime can do so comfortably. Must less air leakage since the machine directs the airflow into the nasal passages. Ideal for patients with beards or mustaches, since this group often find it difficult to get a good seal around the mouth and nose with a standard CPAP mask. May cause discomfort when used under high-pressure due to direct airflow into nostrils. Some risk of nosebleeds and dryness in the nose. The nasal pillows do not fit well, which may cause pressure ulcers within the nostrils. 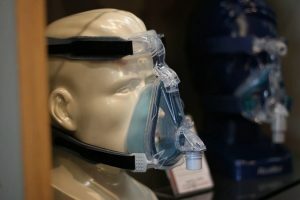 The Nasal Prong CPAP Mask delivers air inside the nasal openings of the nose and is held in place by headgear. The prong rests deeper inside and inflates slightly applying pressure against the nostril walls. The heated humidification feature works well to prevent dryness. May cause irritated nares for some patients. 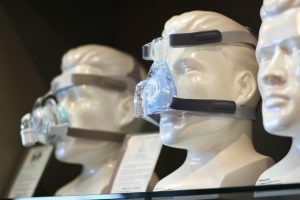 The Hybrid Full-Face CPAP mask provides the functionality of a full-face mask but without the bulk normally associated with these types of masks. A Hybrid not only uses nasal pillow seals at the nostril openings but it also combines this with an oral cushion that seals around the mouth. Offers the option of using nasal pillows in conjunction with a mouth cushion for the patient who is both a nose and a mouth breather. No claustrophobic feeling with less material touching the face. An adjustment period may be required for the nasal pillows to avoid irritation of the nares. The Oral CPAP mask uses an oval cushion to seal around the mouth and delivers air through two inlets inside the mask. An inside flap rests between the teeth and lips and a second flap curls over the lips to keep the mask stable. Delivers airflow only to the mouth. Nose plugs keep the nasal openings closed. An effective design for users who experience frequent nasal congestion. Ideal for individuals who cannot breathe through their nose at all due to a severely deviated septum, nasal congestion or facial injury. Patients find that in the absence of congestion the air the machine blows through the mouth is exhaled through the nose, drying the airway. A heated humidifier with an oral mask is recommended. An adjustment period may be required to become accustomed to the mask. The Total Face CPAP mask is the only mask that uses a large oval to seal the entire face including the nose, mouth, and eyes. The design is ideal for individuals who experience air leakage with a Nasal or Full-Face mask. The seal wraps around the outermost perimeter of the face allowing the soft silicone cushion to fit evenly for maximum comfort. The soft, flexible sealing layer inflates with air pressure, minimizing leaks while providing optimal airflow through the nasal passages. Proper cleaning and maintenance of CPAP equipment are essential to the success of any sleep disorder treatment program. Just a few minutes per day should be sufficient to keep all the components in good condition and the machine functioning efficiently. The following procedures are recommended for all types of CPAP systems. Most CPAP machines sold today include a heated humidification system. This type of system minimizes incidents of morning dry mouth as well as keeping your nasal turbinates moist so they do not become irritated and inflamed. However, the humidification chamber needs to be cleaned out daily to prevent bacteria build-up as well as calcification. Remove chamber from humidifier carefully to prevent water from entering the CPAP machine. Fill with distilled or sterile water only. Once a week immerse the humidifier chamber in a vinegar solution (1 part white vinegar 3 parts water) for approximately 15-20 minutes before rinsing thoroughly with distilled water. Check the CPAP machine’s manual before cleaning humidifier chambers in a dishwasher. Replace the Humidifier chamber every 6 months or sooner if needed. Wash the mask daily with warm water and mild, non-fragrant soap. Rinse with water and allow to air dry. Before using the mask at night, remove makeup and facial moisturizers. Once a week soak the mask in a solution of 1 part white vinegar 3 parts water and then rinse in distilled water. Headgear and chin straps should be washed as needed by hand using warm soapy water. Clean CPAP tubing weekly in warm, soapy water. Follow the manufacturer’s recommended mask replacement schedule. For most masks, the cushions should be replaced 1-2 times per month, and the mask every 3-6 months. Clean the gray non-disposable filter at least once a week. Rinse gray filters with water and allow to dry. Replace the gray re-usable filters every six months. Replace disposable white paper filters monthly. Most insurance policies cover CPAP, however, deductibles and copayments for medical equipment may be different from office visits or prescriptions. Medicaid does cover CPAP equipment, with authorization. Supplies are covered separately and vary by state. Patients should contact their insurer to find out insurance policy specifics. Obstructive Sleep Apnea can be treated for most patients with CPAP therapy. Proper equipment selection is essential and in particular, the choice of mask is critical to the therapy’s success. A comfortable and efficient mask, one that is maintained correctly will encourage the patient to follow the recommended program and result in a restful night’s sleep.